We are glad you’re here! No matter what issues you’re having with your vehicle, we can help. We will provide the level of service you’ve come to expect from a dealership, with the prices you’d expect from a friend. Our licensed technicians are available now, so contact us today. Serving Charlotte for over 20 years! 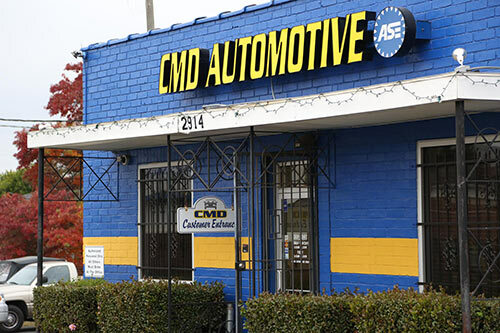 With factory-trained master technicians and a combined experience of over 80 years, CMD Automotive is the best possible partner for your car’s needs. From major repairs to minor, state inspections, new and used vehicle purchase inspections, routine check ups, second opinions, we do it all. We service BMW, Subaru, Honda, VW, Audi, Lexus, Acura, GM, Ford, Chrysler, Jeep, Toyota, Scion, Nissan, Infiniti, and many others. As an independent auto repair and maintenance shop based in Charlotte, N.C., we have the ability and the commitment to bring the very best of ourselves to you without the restrictions of meeting a corporate agenda. Each manufacturer suggests that its brand specific products and diagnostic equipment be used on their car brand so that the life and performance of that car is maximized. As a woman who doesn't know a lot about cars, CMD has earned my trust. I've taken my car for service twice now. I was impressed the first time (upfront quotes, clearly explained, true to their word, fair pricing, provided either a ride or light rail ticket back to my office, clean space inside the wait room). The 2nd time I was having a simple issue w/ my tire light pressure that kept coming on in error and they did not charge me at all. I will cont. to bring my car here. Absolutely wonderful service. The Manager Kevin was nothing but nice and kind with me. I had prior service out of town and they didn't do justice on my car as CMD definitely would recommend them.